Thursday 13th September @ 7:30 p.m. The first lesson: Getting Started is FREE! Getting Started will teach you how to play MiniBridge which is a simplified version of the game. If this whets your appetite then you will be invited to sign up and pay for Module 1: A Bridge Primer at a cost of £48 for 6 more lessons. In total there are about 35 lessons (we tailor the course to suit the students) at a cost of £8 each. You will be expected to pay for between 5 and 8 lessons at a time. Each lesson consists of a short Powerpoint presentation followed by assisted play with specially constructed hands. We email a copy of the slides and hand records with notes to each student after each lesson. 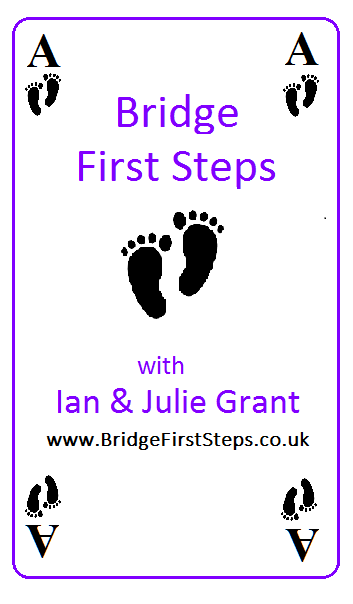 Please reserve your place on 'Getting Started' by sending an email to teaching@BridgeFirstSteps.co.uk; we will send you a Welcome Pack in return. More course details are available by clicking here.